The annual Turriff May Day celebrations take place in the town on Monday 7 May. 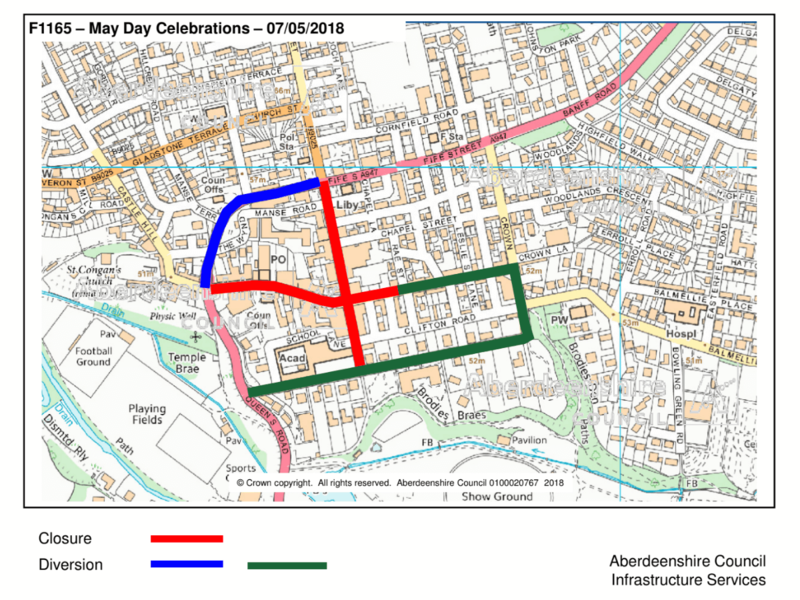 There will be a number of roads closed and parking restrictions in place on other roads locally. 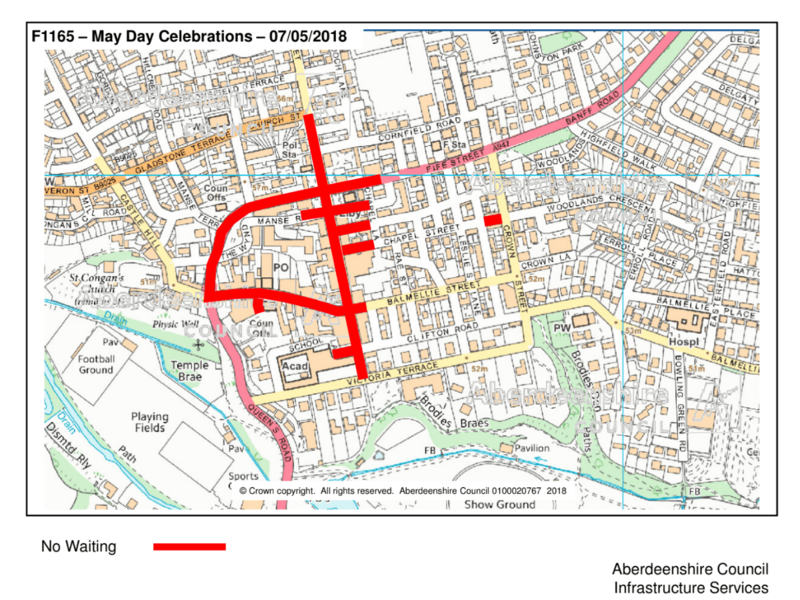 There will be No Waiting (when cones are deployed) on the following roads all day on 7 May. a) MARKET STREET EAST SIDE from A947 to Church Street. b) FIFE STREET BOTH SIDES from Main Street to MacKenzie Gardens. c) DUFF STREET/ BOTH SIDES from Main Street to High Street. d) HIGH STREET CAR/ EAST SIDE from High Street for 15 metres. e) HIGH STREET NORTH SIDE from the Car Park access to Main Street. f) SCHOOLHILL BOTH SIDES from Main Street to Victoria Terrace. g) SCHOOL LANE BOTH SIDES from Schoolhill for 35 metres. h) BALMELLIE STREET SOUTH SIDE from Main Street to Smithy Lane. i) CHAPEL STREET SOUTH SIDE from Main Street to Chapel Lane. BOTH SIDES from Duncan;s Lane to Crown street. j) CHEYNE’S PLACE SOUTH SIDE from Main Street to Chapel Lane. k) MITCHELL’S LANE SOUTH SIDE from Main Street to Chapel Lane. l) MAIN STREET WEST SIDE from High Street to Duff Street. m) MANSE ROAD SOUTH SIDE from Main Street westwards for 20 metres. NORTH SIDE from Sim Gardens eastwards for 60 metres.